This is a scalable context timeline. 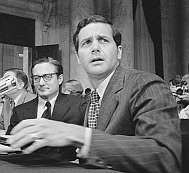 It contains events related to the event March 21, 1973: White House Lawyer Dean: There Is ‘A Cancer on the Presidency’. You can narrow or broaden the context of this timeline by adjusting the zoom level. The lower the scale, the more relevant the items on average will be, while the higher the scale, the less relevant the items, on average, will be. 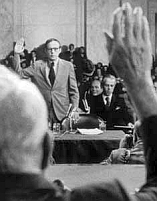 President Nixon tells his chief of staff H. R. Haldeman that the Watergate burglars (see 2:30 a.m.June 17, 1972) “are going to need money.” The next day, burglar G. Gordon Liddy tells White House aides Frederick LaRue (see March 20, 1971) and Robert Mardian that he and his fellow burglars will need money for bail, legal expenses, and family support. Mardian says that the request is blackmail and should not be paid. 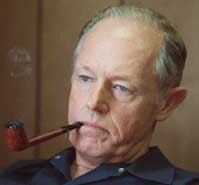 [Spartacus Schoolnet, 8/2007] It will eventually be revealed that Watergate burglar E. Howard Hunt is at the center of a scheme to blackmail the White House for around $1 million in “hush money” (see March 21, 1973).